In two weeks the Fremantle International Street Arts Festival will be held during the long Easter weekend and also on Good Friday. It is my favourite Freo festival and it will the the 20th anniversary of the all free delightful creative and fun street spectacle, so make sure to let friends know and make it very relaxing days out. I love the buzz on the streets, the smiles and excitement and the family friendly ambience and there is always so much to see all over the inner city. This year there will even be evening events AFTER DARK on Saturday and Sunday till 8pm and the fully licensed Seraphim pop-up bar pitch at Little Creatures. The program is full of international and national acts and includes the energy laden WAHONK Fest street bands spectacle and the West End Weekender stalls along High Street. There are printed programs out available at the City of Fremantle library and Visitor Centre and you can also get them at the Roundhouse, and of course there is a Facebook page with all the info . I am really looking forward to this Fremantle weekend of fun where the streets will be packed full with people! Photos like these make me love street photography so much as it is all about being in the right location at the right time, and one can’t plan for it. I am a big fan of so-called street photography and love to pick up those unexpected, not planned quirky photos around Fremantle. I took this one this Sunday morning. 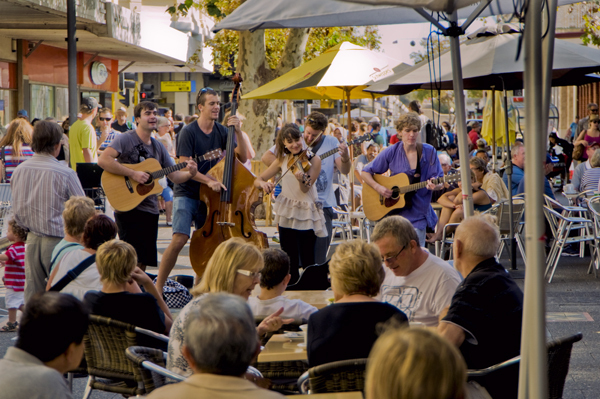 The announcement by the City of Fremantle that buskers who use amplified music will have to get a permit is already a controversial one and not much liked in the muso community. I quite understand the outrage in our over-regulated society that yet again a new permit is needed to just be creative and earn a bit of cash, but I also understand that it can be highly annoying for people in shops and cafes to have to listen to music that is too loud. But what will happen to music like drums, that is not amplified but can still be very intrusive, and will the buskers outside the Fremantle Markets also need to apply because many of them use amplifiers to enhance their voices, play taped music or increase the sound of their instruments. As with all things permits probably cost money, money some buskers might not have and is the reason why they busk. Often the level of the music is not the issue and Council regulation is not what is required, instead what is needed is a really good and honest friend to tell some buskers they can’t sing. The City of arts is pandering to the business community, which would prefer a sterile shopping centre atmosphere in Fremantle, one without beggars, buskers, food trucks, etc. STOP THE LOUD MUSIC FREO! 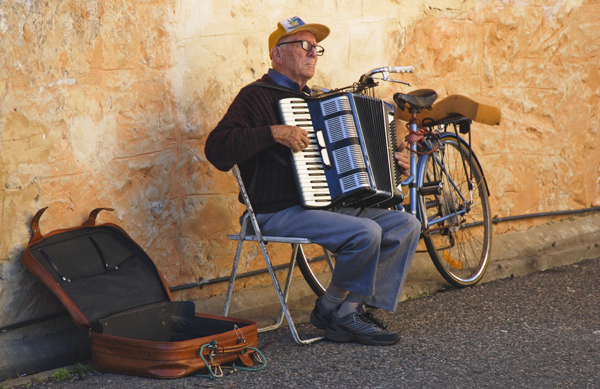 The inner city residents group FICRA is not happy with buskers who play amplified music in the inner city and want the City of Fremantle to do something about it. I believe COF already had decided to turn down the music that is sometimes far too loud, and sadly often those who sing out of tune do it at high volume. I always wonder, like at TV talent shows, why friends and family don’t tell people they can’t sing before they publicly humiliate themselves, but that’s another story. Buskers are great and help activate the city and make it feel vibrant and lively but is amplified music and whole drum kits still busking? On the other hand I strongly believe that Western Australia is far too over-regulated. There are so many things we are no longer allowed to do that it makes overseas visitors question our free and easy and fair go urban myth that no longer appears to be current. No one hopefully will want to stop the music and the fun, but I appreciate it can be highly-annoying to have to listen for hours to bad music played at high volume. To make my point clear from the beginning I don’t consider loud noise entertainment or music, but I do support good busking around Fremantle. Amplified busking has become a bit of a nuisance and that will need to be regulated, but I do not support the banning of buskers from the High Street Mall, Cappuccino Strip or elsewhere in the CBD. 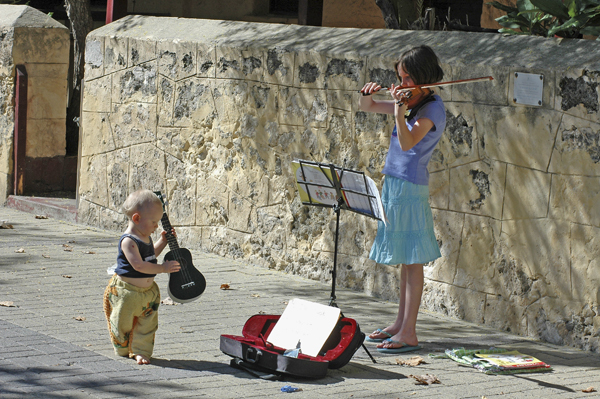 Busking is good entertainment that attracts people as we witness every weekend in front of the Fremantle Markets. Street art performers are also highly appreciated and attract thousands to come to Fremantle from all over Perth on the Easter long weekend. Let’s also not forget that quite a few now famous musicians started their career as buskers, John Butler is one of them! According to Councillor Andrew Sulllivan business owners in the mall can move buskers on when they are too close to their buildings, so I suggest that buskers perform near the trees and the centre of the mall where private owners and their security officers have no authority whatsoever to move anyone on. But please leave your amplifiers at home and make sure your standard of singing or playing an instrument is good enough to share with the public! Written and authorised by Roel Loopers of 5 Maxwell Street, Beaconsfield. # I am not aware the City of Fremantle has officically passed a policy to no longer allow busking in the High Street mall or CBD. # Were the “crowd control” officers City of Fremantle Security or a private security company contracted to local businesses? # If they were officers of a private company they cannot force buskers out of the mall as the mall is a public open space and not private property. # Does the city of arts now ban buskers from shopping areas while wanting to approve large open air concerts in residential areas? # Does the City have double standards when it comes to noise control and protects retailers from noise but not residents? This is very unpalatable to me. I do believe the use of amplified music by buskers could be reduced but I do not support a broad ban on busking in the inner city. It’s boring enough as it is.